FiberMat is ACP’s fiber reinforced stress absorbing membrane. By fortifying asphalt emulsion with fiberglass, FiberMat achieves superior tensile strength and crack resistance. The reinforcement process is simple; after cleaning and preparing the surface, a specially designed applicator sandwiches chopped fiberglass strand between two layers of asphalt emulsion, followed by a 6, 9, or 12.5mm (or combination) aggregate. In addition to providing these great benefits, the FiberMat SAM application process is very fast. 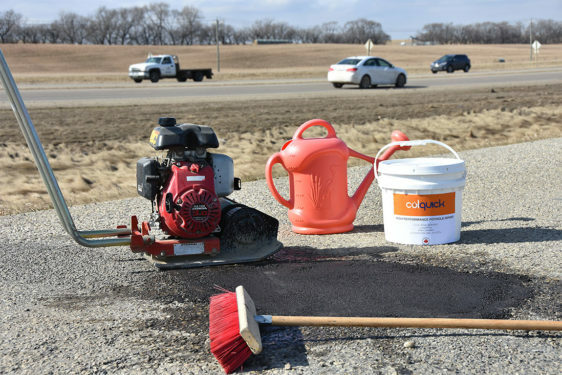 Thanks to a controlled breaking system, roads that have been enhanced with Type-A FiberMat can be opened 15 minutes after completion, regardless of temperature or humidity. FiberMat Type-B shares all the same great stress-absorbing characteristics as Type-A but is specifically designed to be used in conjunction with a wearing course. Both provide superior protection against cracking on the road surface but FibreMat Type-B functions best beneath a layer of asphalt or other road course.